James Hutches, an insurance agent and Keizer resident, responds to the potential of assessing construction and remodeling efforts along River Road with a public amenity fee. The Keizer Chamber of Commerce’s Community Conversation regarding the future of River Road drew about 40 business owners and residents who shared ideas and hopes. 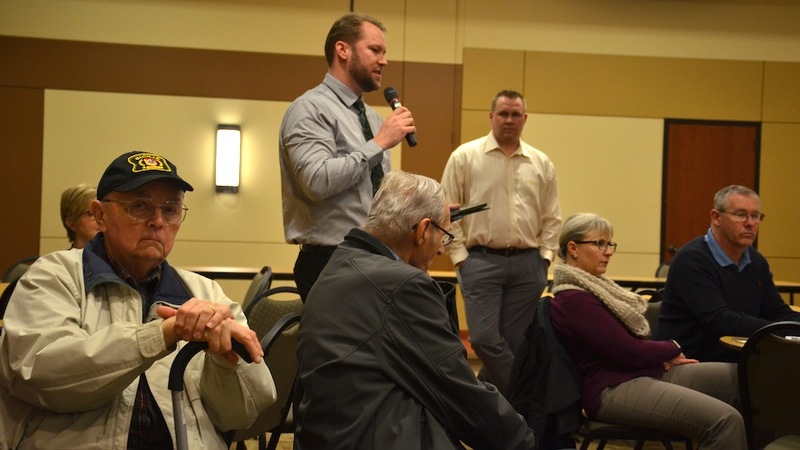 The town hall-style event took place at the Keizer Civic Center Wednesday, Feb. 28, and the primary theme that emerged was increasing safety. Keizer Community Development Director Nate Brown began the proceeding with a brief history of River Road improvements drawing the through-line from when it was two-lane unimproved county highway up to the creation of an Urban Renewal District to put utility lines underground and more recent aesthetic improvements. “We want to get a feel for the threshold of change and how assertive (the community) wants us to be,” said Brown. Hersch Sangster, a member of the Keizer Traffic Safety, Bikeways and Pedestrian Committee was among the first to speak and safety was at the top of his mind. Sangster’s comments tipped off a string of safety-themed issues. • Installing more street lights. • Reducing the number of lanes and driveways. • The improvement or addition of parallel roads and alleys allowing travelers to move along River Road without having to exit and re-enter. • Installation of a signalized entrance/exit at Creekside Shopping Center. • A flashing yellow light at the intersection of River Road and Manzanita. Beautification – and maintaining what already exists along River Road – was another hot topic. “When I was very young and came to this community, there were trees up and down River Road. I would like to see more of them,” said Carol Doerfler. While there were no objections to added greenery, Bob Shackelford, a Keizer resident and River Road business owner, said keeping existing greenery from causing safety issues was already a problem. “I like everything to look perfect, and a lot of places look really nice, but having trees and shrubs that overhang the street is an issue,” Shackelford said. Shackelford’s comments tapped a vein into the larger issue that spawned the community conversation in the first place: a proposed 1 percent fee on new construction and major remodels that would be used to create public amenities. City staff proposed the fee in 2017, and it was approved by the Keizer Planning Commission, but the idea died when it went to the Keizer City Council after strong rebuke from members of the business community. Danielle Bethell, speaking on behalf of business owner Valerie White, asked when funds would come available to beautify River Road. “What business owners are looking for is partnership and incentives,” Bethell said. Keizer Chamber of Commerce member James Hutches said that a city-installed bench near the end at one River Road intersection was rarely used and wanted to see more thought put into what constitutes public amenities. “Should we force things that are not functional just to say we put in an amenity? I think we should have incentives to put functional things in the community,” Hutches said.